Sometimes when we make a new recipe for the first time, we are completely surprised with the outcome. Of course this could be a delightful surprise or a horrid one. I have had a few disasters lately, but this recipe was a brilliant surprise! Everything about it, from the texture, the appearance, and the flavours, screamed, yes! 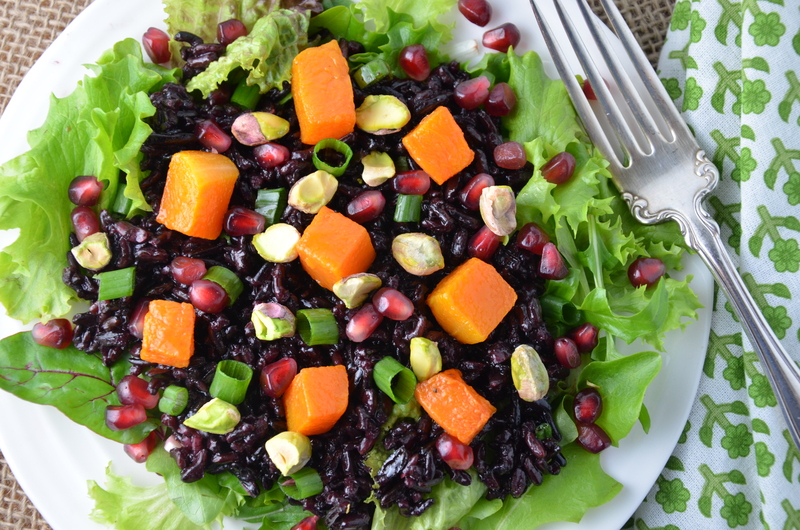 Black rice isn’t commonly eaten here, but the chewy nature of it, combined with the wild rice is beautiful in a salad such as this one. It has a nutty flavour, which makes a lovely contrast to the sweetness of the roasted butternut squash. Both the pomegranate seeds and the pistachios add a crunchy layer to keep your palate wondering what is coming next! My husband and I each wolfed down a huge plate of this beauty for dinner one night and then ate the leftovers for breakfast, for the next few days, knowing I would have to make it again really soon! So I decided to make it for the Fiesta Friday gang. I am starting to get to know some of these crazy foodie partiers and I was pretty sure they would enjoy this salad. If you haven’t checked out Angie’s Fiesta Friday over at The Novice Gardener yet, your really must! We are just having too much fun! I found this recipe in the January 2014 Bon Appétit magazine. 1 cup micro greens or fresh herbs such as parsley, and cilantro or use salad greens like I did. Toss squash with ¼ cup oil and place on a parchment lined baking sheet. Sprinkle with salt and pepper. Roast, tossing once, until golden brown and tender; approximately 20 – 25 minutes. Let cool. Place rice in a medium saucepan and add water and salt. Bring to a boil. Cover and simmer for about 40 minutes until the rice is tender. Drain off any excess water. Spread rice out on a baking sheet and allow any excess water to evaporate. In a large bowl, whisk together vinegar, honey and remaining ¼ cup olive oil. Add rice, squash, scallions, pomegranate seeds, microgreens, and pistachios, salt and pepper and toss to combine. Salad without microgreens can be made 4 hours ahead. Cover and chill. Serve as a side dish or add some roasted chicken and serve as a main course. Wow! So beautiful and such amazing flavours! Thanks Dimple! Yes, we loved the flavours in this! Yum! I can imagine any leftovers would be hard to resist, no matter the time of day! Gorgeous Salad! I never would have put those flavors together on my own, that’s why it’s good to follow other bloggers like you. So pretty. Thanks for the lovely comment, Jillian! I know what you are saying; I am learning so much from being a part of the blogosphere too! Julianna, that plate just pops with color and healthy deliciousness! 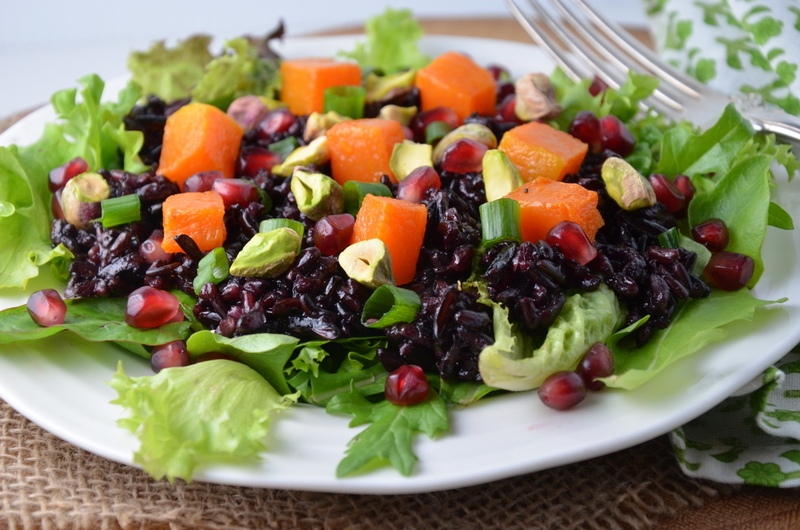 I love the use of black and wild rice in this salad. I always just cook it and have it plain as a side, but I imagine the rice would give a rich, hearty texture to this salad. Thanks for making me rethink my rice usage! So happy my recipe makes you rethink your rice usage, Ngan 🙂 I am also seeing a bunch of new ways to do my salads, so this has been fruitful! Wow, what a beautiful salad! So colorful and what I also love: full with superfoods! 🙂 The black rice looks super interesting, I must try this sometimes! Thanks so much Sylvia! I think it is super healthy. I really should do a bit more research. I’ll let you know! Thanks Sylvia! Yes, I believe that black rice is very healthy! I must do some more research on it. I will let you know what I discover! Beautiful, Julianna! So perfect for spring 🙂 Love the colors! Thanks Lori! I keep thinking spring is on the way, but I guess it is here already! Yeahhhh! I love the addition of the pomegranate seeds! Yum! Me too, Lori! Love that crunch and that bit of sweet / sour taste! Not to mention the colour! Thanks so much! It seems that we are all craving a bit of colour these days…not sure where you live, but I think it has been a long winter! What a pretty looking salad–I love all the colors! I love all the colors in here! Thanks so much, Alex! Good party, huh? I love the cubes of butternut squash on your salad, Julianna! Your salad is so bright and pretty. Simply beautiful! Thanks Patty! It reminds me a bit of some of the yellow/orange that is starting to sprout from my garden this time of year! Black rice is definitely something I don’t eat enough of – thank you for the reminder and an amazing dish to put it in! I really need to branch out as far as salads go. This recipe is inspiring me to do! Hey Noony, keep in touch and let me know what you come up with! We are moving into salad season and I am always looking for something new! Love all the colors! Yum! Thanks so much! Perfect party food! Thanks MB! Let me know what you think if you get a chance to try it! Well, I do love a party, and you throw an awesome one – so many interesting people and such awesome food. I was happy to find a new way to use black rice too, but I hope to make a coconut/mango pudding with some of my bag too. Thanks again, Angie! Truly amazing salad, or as a side dish is great too! 🙂 I like to mix different kinds of rice as well, super heathy option! Beutuful photos, Julianna! Thanks so much for the comment! I am always looking for a healthy salad recipe and this one fits the bill. Glad you like the pics! Such a beautiful and refreshing salad. We’ve never used wild rice, though have always seen it. I think it’s time to try. Yes, wild rice is wonderful! I have used it in many dishes. Really lovely in salads with dried cranberries and roasted walnuts! Yum! We eat with our eyes first and this recipe certainly is a feast FOR the eyes! 😉 Sounds like a wonderful mix Julianna. 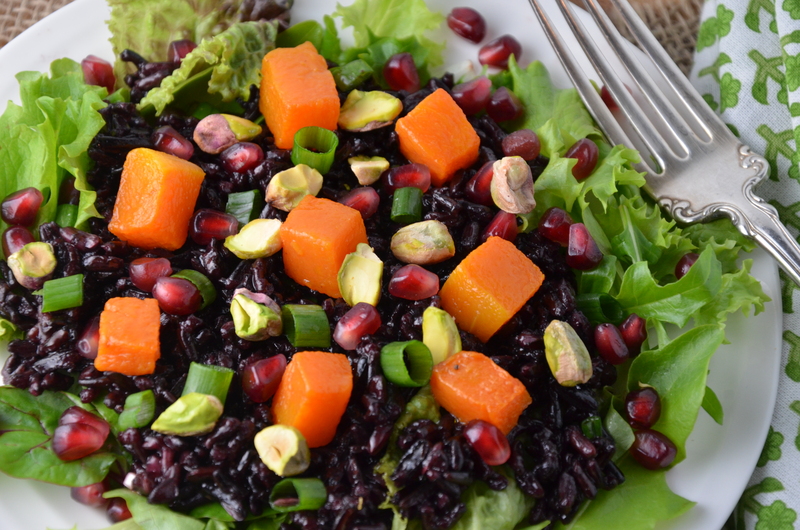 I love black rice, what a brilliant contrast it adds here, to all the other colors and textures in this salad. I’ll have to keep this for later use. thank you! PS: What are you making for dinner tonight? I’m making beet burgers and some side dishes. I’m finding all kinds of ways to eat beets lately, I just love them soooo much! This salad looks so inviting and soul satisfying Chef! Gorgeous color combinations and flavors :). This looks delicious and the combination of flavors, it sounds so fresh and delicious. Wow, this salad is stunning, and I love the myriad of flavors. I’m a texture person so I like a little bit of crunch coupled with my more malleable bites. This certainly fits the bill, and the combination of sweet and salty seems ideal. Well done. Hi Meghan. So glad that this salad appeals to you. Such beautiful colour and flavours! I will have to try this! What a bright and beautiful salad! I love wild rice, but haven’t had any for a while. Thanks for giving me the motivation to cook some!